I'm just back from the South of France with a review of Serge Lutens Boxeuses and a draw for a sample of the new Palais Royal exclusive: watch this space! Je viens de rentrer du Midi avec, dans mon escarcelle, un avis sur Boxeuses de Serge Lutens et le tirage au sort d'un échantillon du nouvel exclusif du Palais Royal: rendez-vous bientôt! Welcome home! Hope the trip was good. 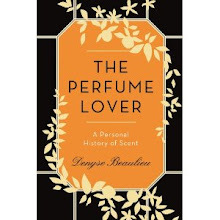 Amy, it was barely a trip, just a few days at my friends' place in the Vaucluse: he's a writer, she's an artist, so we were all in our respective offices/studio, sometimes met by the pool, and had long al fresco meals discussing art, literature, and... perfume. Very productive! I came back last wednesday from my nine days holiday in the South of France, too! I've been to Languedoc-Rousillon and Midi-Pyrénées. Welcome home...and even if just a few days, your time sounds lovely. 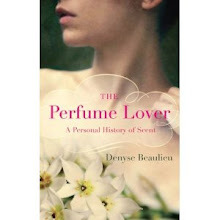 Scentscelf, I have to give priority to my book right now, so I only wrote one review. Also, the debate on the Edmond Roudnitska post, on the French side, was so involved I must've written the equivalent of 5 posts just to reply! Nicola, kill it now! Kill it! Before it turns into the Millenium Dome sized fig that ate the world! Well, you encourage me to continue pressing myself to learn French. Healthy discourse is one of my favorite aspects of bloggery. I do hear you on the effort/thought it takes to participate...have always appreciated the care you put into your contributions, whether in your posts or in your comments, here or elsewhere. ScentScelf, have a look at Elise's comment in the English version (she helpfully translated herself from the French). She says very important things about the current state of the industry, and I'm surprised no one has picked up on it yet. Welcome back! I am planning some Provence road trip in mid-September actually. Lavende is not my favourite smell, but local people and also great cuisine always make feel so great. Looking foward to reading your next reviews!